Since 2003, the Madison Blues Society has demonstrated commitment to community – both musical and otherwise. While promoting education, awareness, and appreciation of blues music remains at the core of the organization’s mission, MBS has also played a positive role in other ways - such as outreach with the neighborhood centers and the Boys and Girls Club of Dane County. Students who learn from these programs have been featured performers at the MBS’s major summertime event, the Blues Picnic. 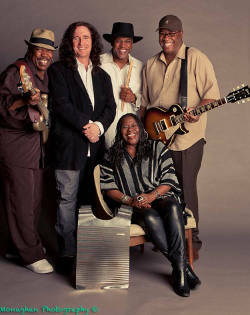 MBS added a new annual event seven years ago: the “Wild Women of the Blues” series – a reference to an early blues song written and performed by Ida Cox, and also successfully recorded by Bessie Smith and numerous others in the decades since: “Wild Women Don’t Have The Blues.” While the series was previously intended to help cover the costs of the Picnic, the event organizers have chosen to expand the purpose of this year’s event, with proceeds going to organizations that serve women and families. This year’s show, which will be held at the High Noon Saloon in Madison on Thursday, March 20, beginning at 7:00 PM, will benefit Dane County’s Domestic Abuse Intervention Services (DAIS). DAIS offers a number of crisis-based services, including a 24-hour help line, emergency shelter for domestic violence victims, crisis response, legal advocacy, and support groups. In 2012, the help line fielded more than 7,000 calls; while more than 500 clients were served through the other crisis programs. DAIS also works to prevent domestic violence through workshops, presentations, and training programs, including several that teach young men positive behaviors about respect and safety. This year’s acts carry the “Wild Women” moniker with authority. Headliner Peaches Staten was born in Doddsville, Mississippi and raised in Chicago with a diverse mix of musical influences, including blues, gospel, and soul. Over the years, she’s lived in Sweden and fronted zydeco and Afro-Brazilian bands before focusing on blues (although you’ll still hear an occasional zydeco number from her). Staten’s popularity extends to both South America and Europe, two of her regular tour destinations. Her most recent CD, Live At Legends, showcases Staten’s energetic and assertive vocals; it also has the distinction of being the last recording session held at Legends’ former South Wabash location. Her band, the Groove Shakers, is fronted by one of the top younger blues guitarists, Mike Wheeler. The opening act, the Stand Back Blues Band, has roots that stretch back more than two decades – where the band commanded Central Wisconsin clubs such as the Scott Street Steak and Pub in Wausau. The reformed ensemble features two commanding artists up front: Blythe Gamble and Bryan Koenig. Gamble’s declarative vocals and lyrics provide a sassy counterpoint to the raspy growl of Koenig. Koenig’s veteran harmonica prowess echoes Little Walter and Rod Piazza; that talent runs in the family – his brother, Madison Slim, toured with Chicago blues legends for decades. Tickets for the Wild Women of the Blues are available in advance at the High Noon, the Knuckle Down Saloon, or at the Bristled Boar; MBS members receive discounted prices. More information on MBS events, outreach, and membership opportunities can be found at www.madisonbluessociety.com . And for those of you already longing for warm summer weather – the date of the Blues Picnic has been announced: June 28th. As in previous years, the event will be free and family-friendly.